In a tweet, West said "his eyes are now wide open" and he's "been used to spread messages I don't believe in"
In this Oct. 11, 2018, file photo, rapper Kanye West speaks during a meeting with U.S. President Donald Trump in the Oval Office of the White House in Washington, DC. 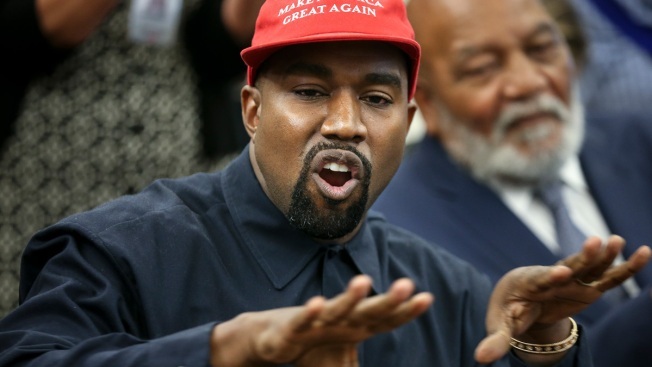 Just weeks after meeting with President Donald Trump in the Oval Office, Kanye West tweeted Tuesday that his "eyes are now wide open" and "now realize I've been used to spread messages I don't believe in." In the meeting which was supposed to focus on prison reform, West - wearing a red "Make America Great Again" hat - rambled on about abolishing the 13th Amendment, gun violence, his battle with bipolar disorder, and other topics. West also commented on 2016 Democratic presidential nominee Hillary Clinton's slogan "I'm With Her," and how it didn't resonate with him as a man.